Normally, peering deep into space lets astronomers see into the distant past, but a new discovery has now given us a glimpse of our solar system’s future. A NASA-led citizen scientist project has discovered an ancient white dwarf that’s surrounded by large rings, which is shaking up our understanding of how these systems form. Officially known as LSPM J0207+3331 (or just J0207), the white dwarf is about 145 light-years from Earth in the constellation of Capricornus. It was found to be simmering away at about 5,800° C (10,500° F), which indicates that the star is roughly 3 billion years old. But the most interesting thing about it is, of course, its rings. NASA’s WISE mission picked up a strong infrared signal around J0207, the telltale sign of two dusty disks surrounding the star. While it isn’t the first white dwarf found to sport a ring system, it is the oldest and coldest by quite a wide margin. The traditional story of how a white dwarf develops rings starts before the star is even a white dwarf. When a main sequence star – like the Sun – runs out of fuel, it swells up into a red giant. That incinerates any closely-orbiting planets or asteroids, while those further out will drift away as the star loses its gravitational grip on them. The stellar core left behind is the white dwarf. These start off incredibly hot and dense, but because the fusion process inside has stopped, they gradually cool over billions of years and dim to become what’s known as a black dwarf – or at least they will eventually. The universe isn’t old enough for any to actually exist yet. Anyway, the gravitational chaos caused by all the planets floating away from the star is thought to fling some asteroids and comets in towards the white dwarf, where they’re torn apart by tidal forces. And voilà – there’s your rings. But those dusty disks don’t stick around forever. The star pulls them inwards and consumes the material – even Saturn is currently slurping up its famous rings at an astonishing rate. 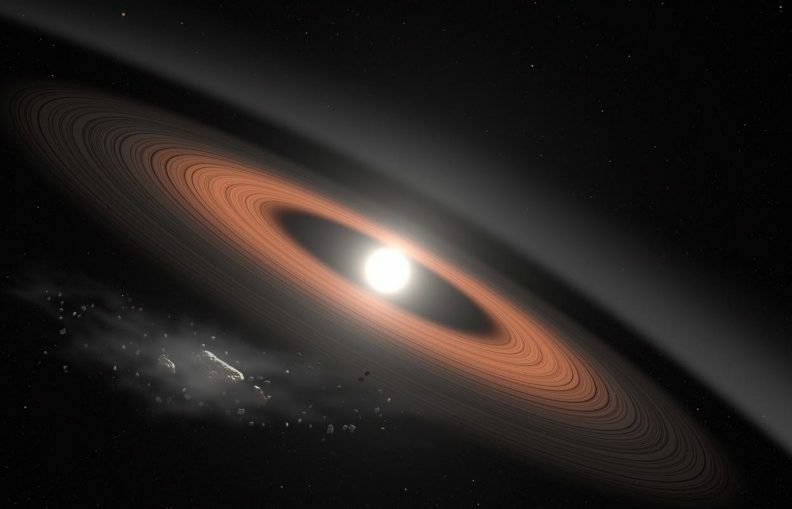 Because of that, astronomers generally thought that older white dwarfs would have destroyed any rings long ago. The discovery of J0207’s intact ring system at that age may call for a rewrite of our existing models of how star systems evolve. After all, our own solar system will likely go through a similar process, starting in about 5 billion years or so. The find itself was initially made by German citizen scientist Melina Thévenot, as part of NASA’s Backyard Worlds: Planet 9 project. As the name suggests, this program was set up to get more eyes searching for the hypothetical ninth planet, which may be lurking on the fringes of the solar system. After Thévenot spotted an infrared anomaly in Gaia data, it was investigated by the Keck Observatory in Hawaii and identified as a ringed white dwarf.